Mount Only; Radome sold separately. Still the first choice of boat owners the world over, Scanstrut platforms are the ultimate solution to mounting radars on yacht masts. By working closely with all major marine electronics brands worldwide Scanstrut is able to continually update their product range and provide a mounting solution for even the very latest antennas. 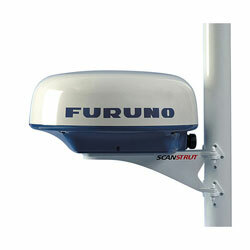 Simrad DX45, among others may require a mount Adapter (19041) available by special order.